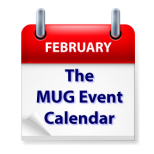 Two great speakers highlight this week’s MUG Event Calendar. Bob “Dr. Mac” LeVitus will deliver a “State of the Apple” address to a Texas group, and Christian Pickman of Micromat will talk to a California group about drive maintenance, recovery and their utilities. Other topics to be covered this week around the world include the iPad, iPhone and iPad, the Apple Watch, printers, tax and financial software, streaming video and more. Houston Area Apple Users Group – Bob LeVitus – The State of Apple and "Cool Stuff Dr. Mac Likes"